Even with tight deadlines, I always start with a rough sketch of the idea before I take it to the computer for the final. 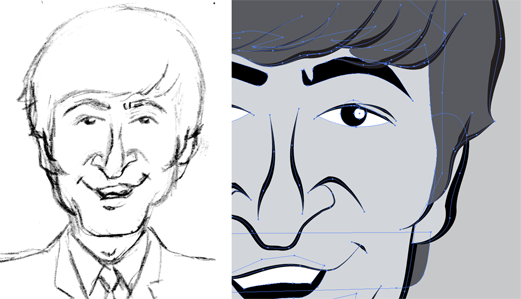 The final illustration often varies in size according to the art director’s layout. The vector format facilitates sizing much better. For more than a decade, I’ve been privileged to partner with Vintage Guitar magazine on a number of projects ranging from T-shirt designs to publication layout. One of the magazine’s most frequent assignments for me is generating art for the Reader Mail column. 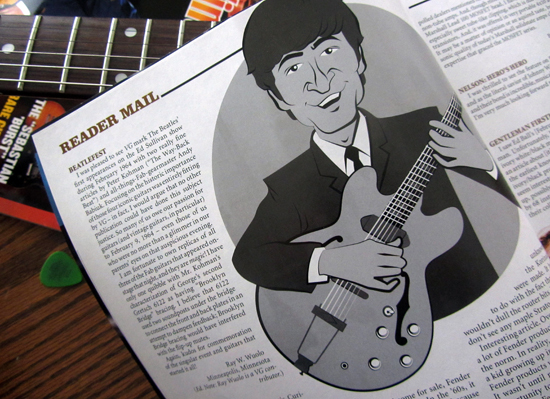 Every month I have the opportunity to illustrate one of the guitar-related subjects shared by faithful readers of the magazine. In the early days, I utilized pen and ink and digital color to execute raster illustrations but have streamlined the style to an all-vector digital format. It wasn’t that long ago that I could joke about doing all these drawings of guitarists and their instruments, having never owned a guitar myself. No more. Ironically, this gig has given me a beautiful, PRS Torero (signed by Paul Reed Smith himself) that I’ll most likely pass on to my youngest son who does play guitar.